It is with much sadness that we farewelled St John stalwart Marian Grayden who passed away on Friday, 26th May. Marian, a registered nurse, joined Darwin Combined Division on 2nd May 1967 under her maiden name of Rowlands, and served for many years as a volunteer until her retirement in 2007. During retirement Marion maintained strong ties with St John Ambulance, contributing to the book Awkward Hours, Awkward Jobs and providing other historical information. Her funeral was a small occasion, attended by a number of St John members who were fortunate to have served with her and was a fitting tribute to an exemplary mentor and role model. There are many members who are thankful for her advice and support over the years. She had the respect of all who worked with her during her time with us and will be missed for her down-to-earth comment and attitude towards life. Last month saw a major milestone for another long-serving member, Steve Peers, who celebrated 40 years as a volunteer with St John Ambulance in the Northern Territory, having joined Casuarina Combined Division on 2nd June 1977. Steve was recruited into the Ambulance Service in 1979, while remaining a volunteer member of the St John Ambulance Brigade. A special edition of Vollie News was produced on Steve’s retirement from the Ambulance Service, documenting the many achievements and milestones throughout his career. A first aid course in the early 70’s with the St John Ambulance Brigade at their Parap Headquarters started his association and the rest they say, is history. Congratulations Steve on this momentous occasion. In May we held the Annual Investiture and Awards ceremony in Darwin and due to the large number of recipients from the Southern Region who were unable to attend, we were fortunate to be able to hold a second Awards presentation in Alice Springs earlier this month. The Awards were held at the Council Chambers and hosted by His Worship, Mayor Damien Ryan, who presented recipients with their awards. In addition to staff being presented with certificates and receiving years of service awards, there were a number of volunteers who were also presented with medals and bars for their voluntary service. Ben Falzon - 15 years of service. Tom Falzon and Dan Falzon 10 years of service. Richard Brady & Andrew Everingham - 5 years of service. Johnny McKay was presented with his Certificate III in Communications. Glen Auricht received his bar for 22 years of voluntary service; Sarena Hyland received her 12 year medal for voluntary service Steve Peers was presented with a certificate celebrating his 40 years of volunteering with St John. In conjunction with The Rotary Club of Darwin Sunrise, St John Ambulance NT are now seeking nominations from the public for this year’s Paramedic of the Year awards and encourage patients, their family or carers to nominate a paramedic who has demonstrated outstanding abilities. The awards have been supported by the tireless work of the Rotary Club of Darwin Sunrise for the past 17 years. Without Rotary support St John Ambulance would not be able to recognise the fantastic work of our paramedics, patient transport officers and communications officers. Honour one by nominating today. The Blood Service’s annual Emergency Services Blood Challenge started on June 1, just in time to help combat a traditional drop-off in donor numbers across the nation. The challenge runs from June 1 to August 31 and will see Emergency Services groups in Darwin vie for the highest blood count. The Emergency Services Challenge has been running for three years in the Northern Territory and is part of the Blood Service’s Red25 group donation movement. During the annual challenge, emergency services organisations all over Australia compete to give the most blood donations. 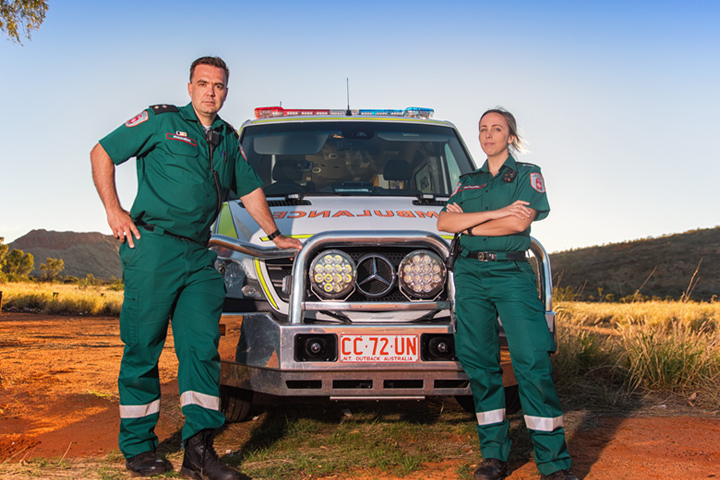 This year there’s even more reason to donate — along with competing with other emergency services in the Territory as usual, we’ll also be competing against our service colleagues in other states. It’s our chance to prove that St John Ambulance NT is the best at donating in the country! Last year, generous donors from our members made 41 blood donations. Since every donation saves up to three lives, that’s almost 123 lives saved, which is pretty amazing. We want this year to be even bigger and we need your help. To make an appointment at the Casuarina Blood Donor Centre call 13 14 95 or visit www.donateblood.com.au.